A Lakeview liquor store clerk was pushed to the ground by three teenagers who proceeded to steal booze on bustling Diversey Parkway yesterday afternoon. 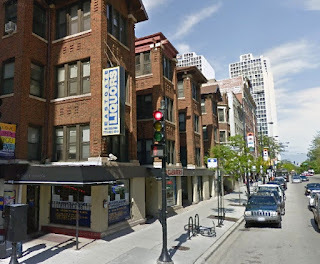 Police were called to Eastgate Liquors at Diversey and Pine Grove at 1:50PM Sunday after the clerk called for help. He reported that the three offenders drove off in a white minivan. Officers determined that the van had been stolen on Saturday from the South Side. 1) male, black, 6'2" tall, 16-20 years old, long braids, white boonie hat, t-shirt. 2) male, black, 16 or 17 years old, medium complexion. "This one did the pushing," according to the clerk. 3) male, black, 16-20 years old, wearing a white t-shirt with "RIP Bobby" and a picture of "Bobby" airbrushed on the front side. Late Saturday night, two black men allegedly implied that they had a weapon when they stole booze from Leland Liquors, near the Western Brown Line station. No arrests were made.